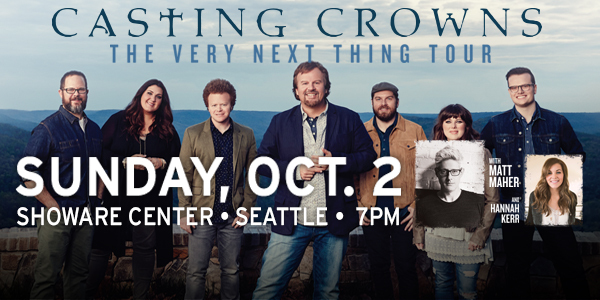 The Casting Crowns, featuring Hannah Kerr and Matt Maher, are coming to ShoWare Center for an incredible night of worship on Sunday, October 2, and you can win tickets, compliments of iLoveKent.net and ShoWare! Enter to win by sending us an email with your name and with ‘Casting Crown Tickets’ as the Subject Line. One entry per person please. The winner will be selected at random on Tuesday, September 27, so get your entry in now! Don’t want to wait? You can purchase tickets online now at ShoWareCenter.com. Tickets start at $22 for View seats and go up to $77 for VIP tickets which include a seat in the first seven rows on the floor. Parking is free at ShoWare, at the Metro Park ‘n Ride lot across the street or in the Regional Justice Center parking garage.